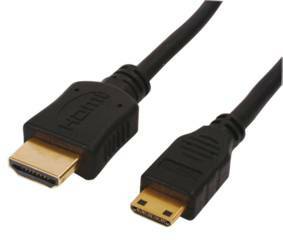 LONG HDMI TO MINI HDMI CABLE 10M GOLD PLATED High Speed With Etherne - Mini HDMI Cable - Micro HDMI Cables, Hdmi Cables Same Day Dispatch On Our Leads If You Order Before 2pm Weekdays. HDMI lead with 19pin To Mini HDMI gold plated connectors. There are many issues which can affect the signal of a HDMI cable, we always advise you test longer cables in place before any final building fix. Currently viewing: LONG HDMI TO MINI HDMI CABLE 10M GOLD PLATED High Speed With Etherne - Mini HDMI Cable - Micro HDMI Cables, Hdmi Cables Same Day Dispatch On Our Leads If You Order Before 2pm Weekdays.